What a change right? Furniture, pillows and plants made all the difference! I had been on the hunt for the perfect sectional out here since last year, and I finally found it at Hayneedle. I was thrilled that Hayneedle wanted to partner with me and provided the furniture for beautifying this space. 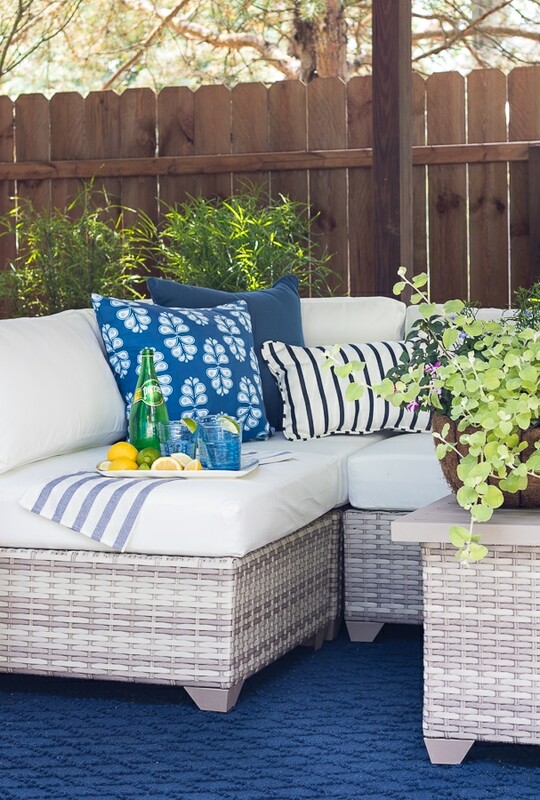 They have such a great selection of outdoor furniture and accessories to really bring your space to life. I mean clearly, just look at the before and after out here! 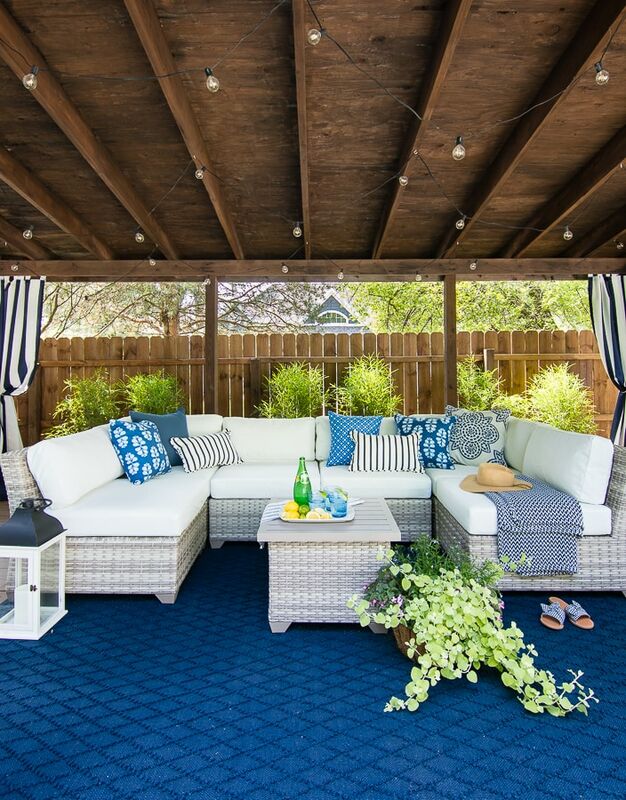 This new outdoor sectional seating area is so comfortable, not to mention gorgeous. I love that it’s all separate pieces so it’s easy to move around. We could separate it and have a couch and 2 chairs, but I love how cozy the u-shaped configuration is. It really makes this space feel like a cozy living room. The cushions are all slipcovered, so I can just throw them in the washing machine for easy cleaning. 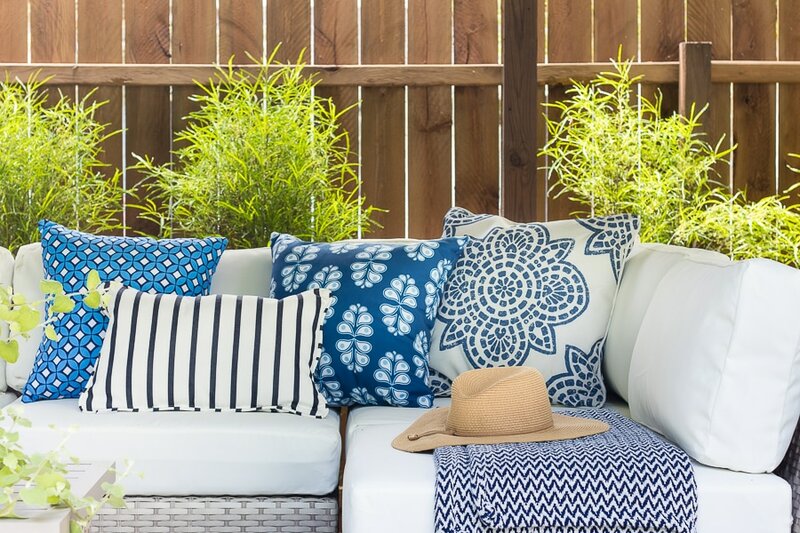 Hayneedle has a huge selection of colorful outdoor pillows and it was fun to mix and match the patterns out here. It’s even more fun all lit up at night! I absolutely love these huge wooden planked planters from Hayneedle. They are so fun and beachy with ferns planted in them. 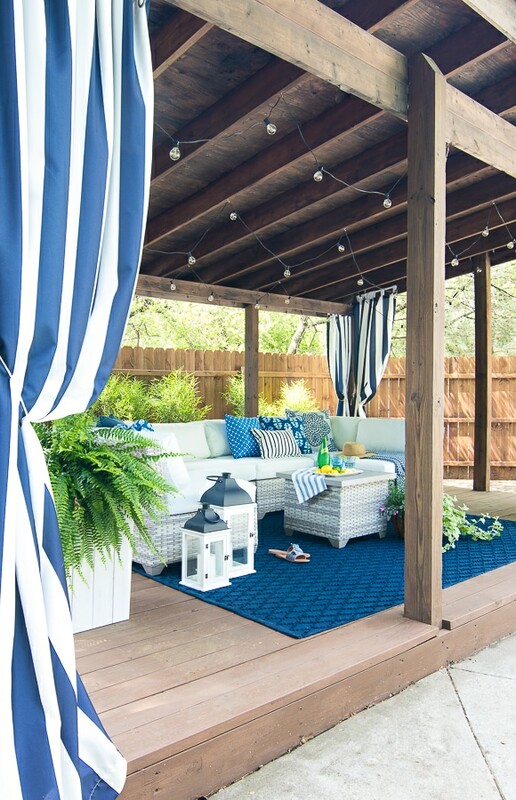 The cabana is great for shade, but we also have some lounge chairs over in the sun, and we tied in the blue and white theme with new pillows. 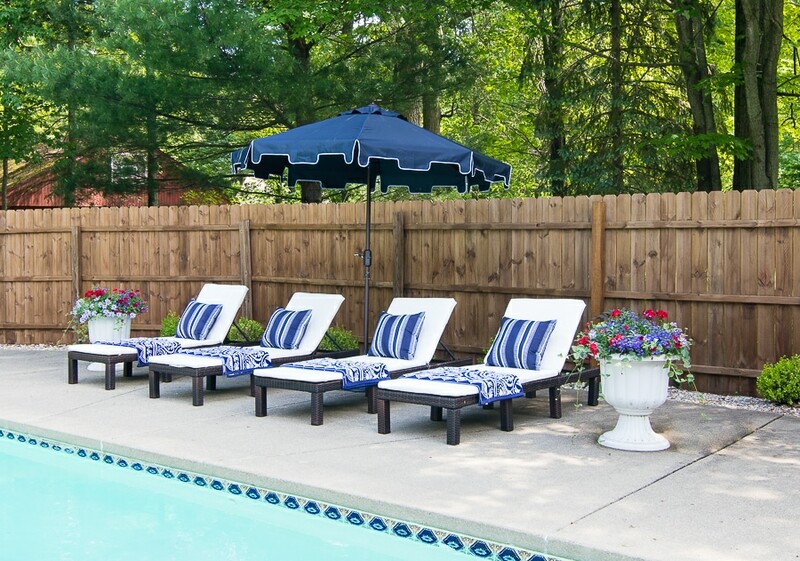 I love the way the pillows coordinate with the navy pool tiles and the umbrella has the cutest detailing. Can you believe this space used to look like this? Now it’s pretty and functional, and we have been spending SO much time over here! I also wanted to show you the backside of the couch – I love the grey variations on the wicker. 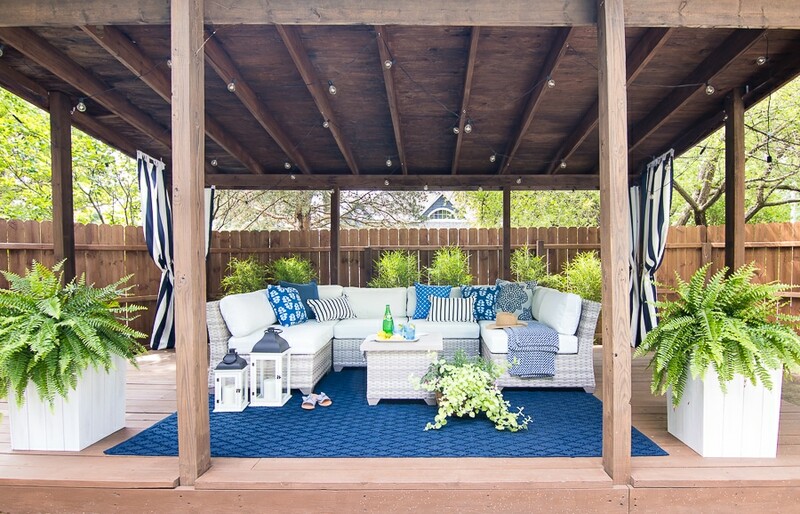 The coastal feel is a perfect contrast with the dark stain on the cabana. I also found the outdoor rug at Hayneedle and it really grounds the whole space. I love the texture of it and it washes up easily with a hose. Which is good, because I really envisioned this being the quiet mom zone of the pool area (quiet – ha! ), but as you can see everyone (even Charlie) has made themselves at home here. :) My daughter also has big plans to make this her karaoke stage at night, and I for one, cannot wait to see/hear that! Hayneedle just launched a fun new feature on their site, the Find, in which they serve up a hand-selected item each day that I know you’ll love. You can see the new daily “Find” here. I’ll also link each individual item in a source list below (just click on the bold words) for easy shopping, but be sure to check out all of Hayneedle’s amazing products here! Beautiful! You are amazing. Enjoy your Michigan summer. I’m having severe “up north” home sickness. I will not make up this year. I’m going to Cape Cod and Nantucket. I’ve never been to the northeast and that area has been on my bucket list for years. Oh Cape Cod is on my bucket list too! I’ve never been to the east cost besides NYC have a great trip! Just gorgeous! My pool dream! What are those interesting bushes behind the sectional? Love them too! Oh man I knew someone was going to ask about those and I saved the tag in a drawer somewhere and now I can’t find it lol. Aren’t they cool? I’ll do some digging and find out. They are supposed to get little blue berries on them too. They are such a pretty color when the sun shines on them. Thanks so much Marta, this was such a fun project! Looks amazing! 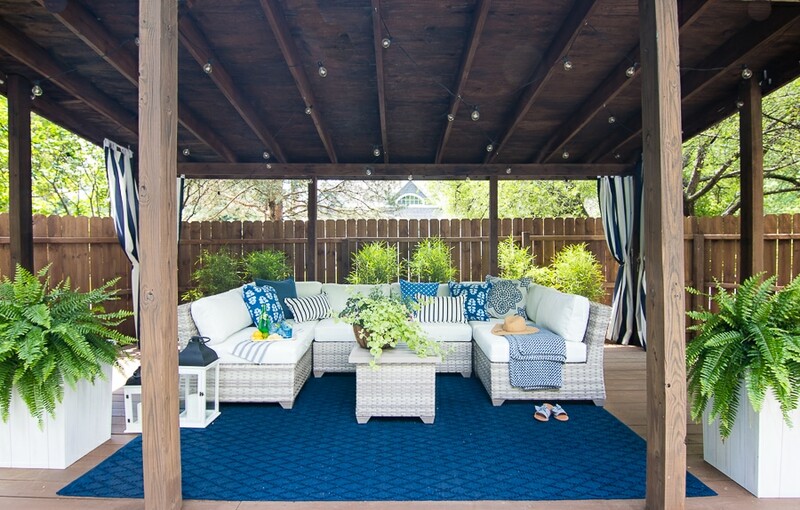 I can envision enjoying the summer weather in that beautiful outdoor area. Blues, greys and whites are my favorite! Mine too! It’s such a relaxing space now. Absolutely gorgeous! It looks like a ritzy resort pool! Thanks! Now I just need a fancy waiter to bring me an umbrella drink ha! What a change. Looks great. Love the navy accents! Thank you Pattie, I always love navy and white in the summer :) ok and all the time! 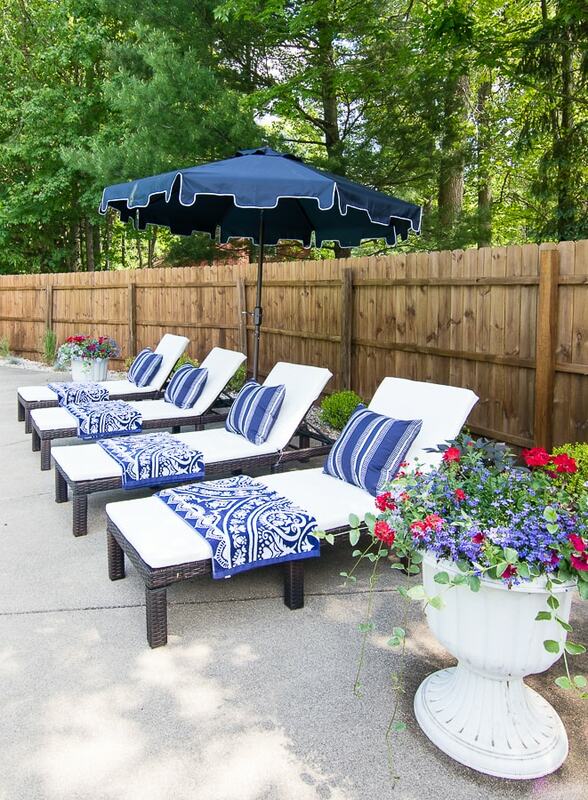 Looks like a relaxing spot to enjoy the summer weather! I’m sure that many wonderful memories will be made there! Thanks Marie, we have been enjoying it so much out there already! So inviting! 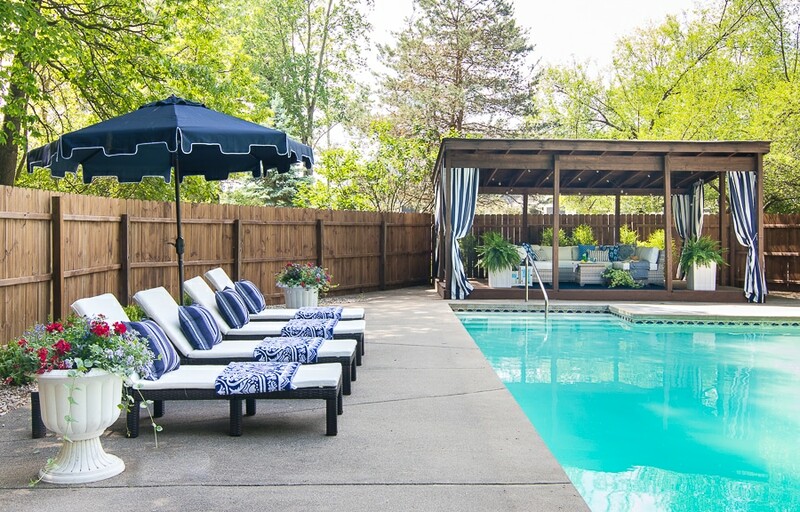 Looks like the perfect place to spend summer in MI! Absolutely gorgeous!!! Love everything but could really use some curtains like the striped ones. What is the source for them? If you listed it, I missed it. Thanks. Love it! Beautiful space! 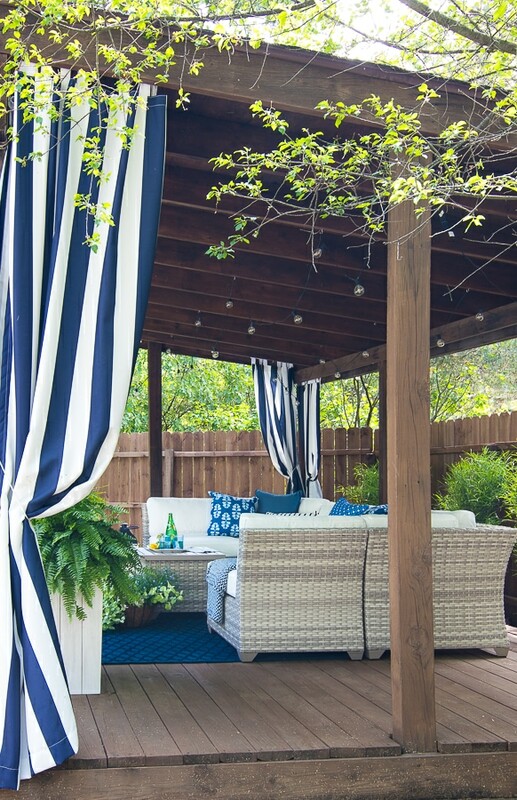 I’d love to hear more about the cabana drapes – how they are hung, material, etc. Thanks! Oh I should do a post on how I hung those! I used thin white plastic pvc pipes and they are just outdoor drapes you can buy them at Hayneedle too! So so lovely….it’s hard to top lake view living but wow!! Home is where the heart is and clearly you have put your heart into this project. Pure Michigan joy!! It all looks great! Do you know what the plant is (in the container on the table) – the one that is a lighter green, trailing plant? Thanks! How Beautiful!! Can I book a weekend for two? LOL Absolutely gorgeous transformation, Kelly. Wow this looks amazing! Like a vacation destination!! Great job Kelly :) We were on the lake memorial day weekend and seeing your new house is breathtaking! Do beautiful! How did you hang lights and drapes? I hung the lights with those little white screw in hooks in the ceiling and then the drapes with pvc pipes! So beautiful!! You’re such a rockstar designer. Thanks for sharing your creative spaces with us. Would you mind sharing what color you stained the wood? Thanks!! Stunning as always!!! How did you hang your curtains? Also, what did you use to tie them back? 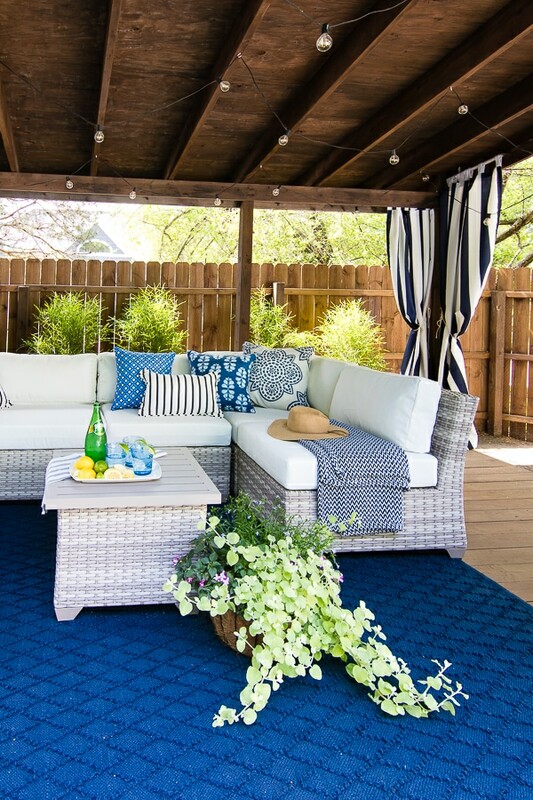 I’m getting ready to make outdoor curtains for our deck and can use all the tips I can get! I’ll have to do a blog post about it, I used pvc piping! Amazing transformation! I don’t have a pool, but loving the colors for my living room! COME TO MY HOUSE! LOL, Love all of it..great job! Thanks so much Michele, it was a fun project! Absolutely gorgeous. You are an amazing decorator. This looks like it should be on the cover of a magazine for everyone’s backyard dream escape. Looks like a spa! It turned out fabulous! Wow! What an oasis! I guess you know you are living the dream of many! You have quite the gift of decorating! Everything is perfect! Magazine worthy! Oh thanks so much Kathy!! Will you share the sources for the towels and lounge chairs? The space looks fantastic. 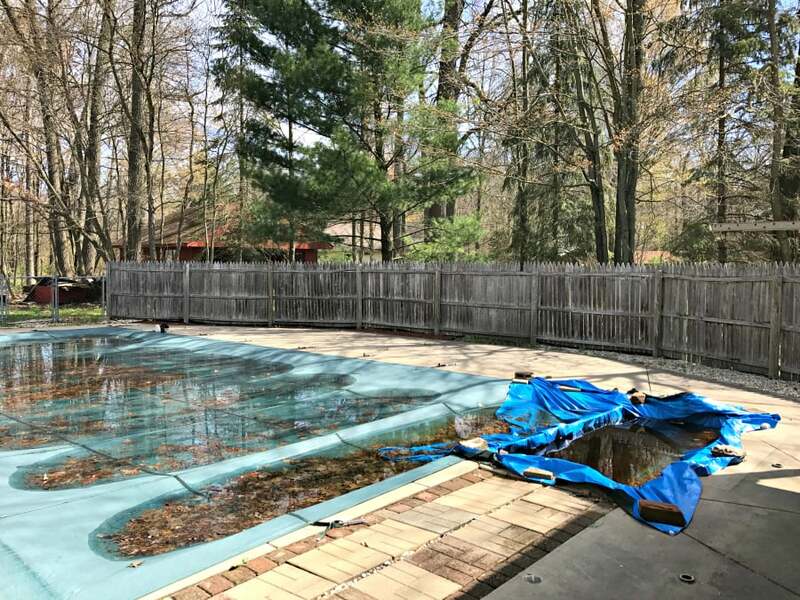 We are in the middle of adding a pool cottage and redoing our backyard. On the hunt for furniture and accessories. Using same color scheme, so your post is such a helpful resource! And I love those white planters by the lounge chairs, too. Thanks I stole those from my mom’s garage ha! Wow! That is one dreamy space, it looks like a poolside at a resort. I love all the blues…so calming and beautiful! I would also love the source of those beautiful towels on the lounge chairs. Everything is beautiful! You are very talented and smart. It is a beautiful space and I can see your kids as they grow up having all their friends at your house. It will keep your kids close to home where you will know where they are and what they are doing. Smart! Remember, money you spend on pizza and snacks at your house for your kids and their friends is money well spent. I hope the furniture is well scotchguarded. it’s gorgeous! 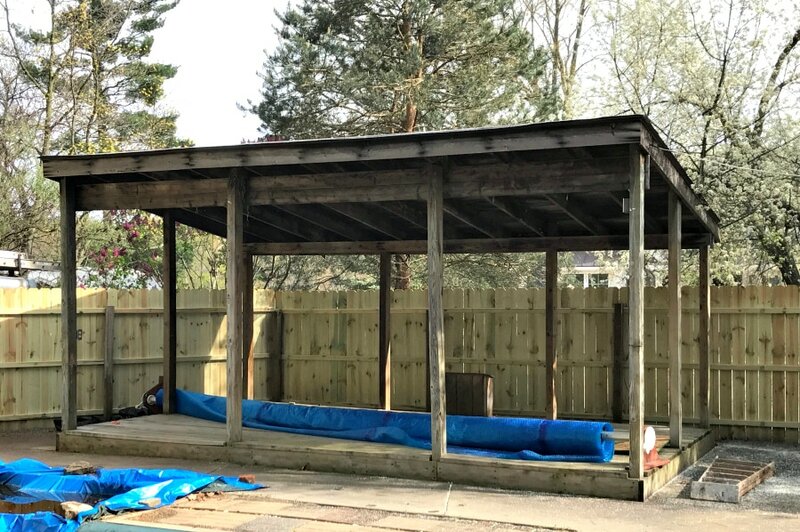 Thanks for sharing, I have been waiting patiently for this renovation. Love this all so much! Are you chaise lounges also from Hayneedle? Can you share the name of them? Thanks! What a beautiful makeover ! I love the furniture, what color are the cushions I looked on the website and there are two that look similar to me. They don’t appear to have names. Love the rug what size is it ? Thank you for sharing , I enjoy the blog very much. I have NEVER been soooo in love (even with Sam Elliott) iin my whole entire life…. 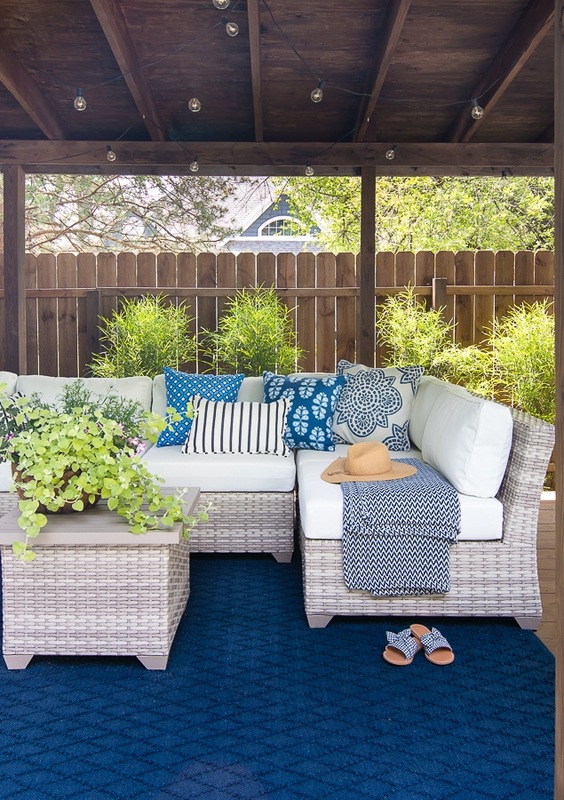 Your outdoor space is gorgeous! Thanks Kristin it’s been such a fun space for us! Your entire home is such a dream! You have a great eye. 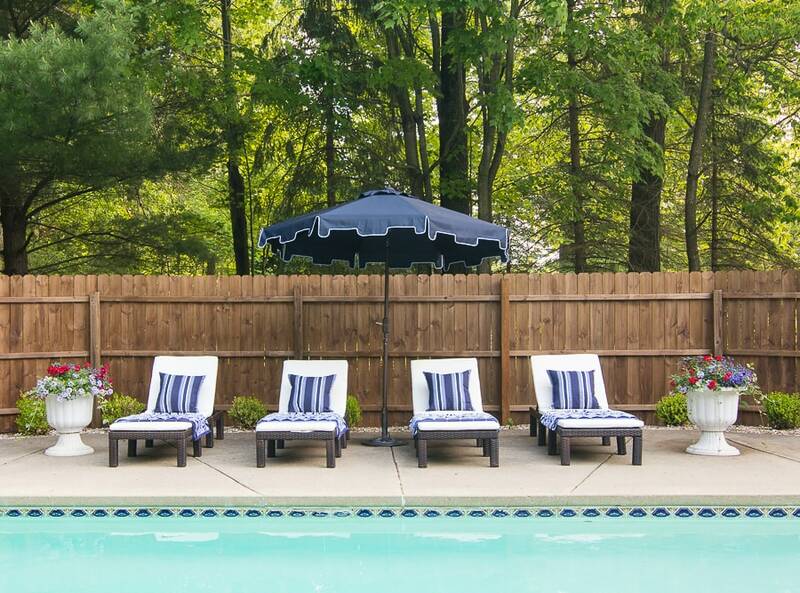 Oh my gosh, your pool, cabana and home are absolutely gorgeous. I follow a lot of blogs and your home is by far my favorite! I love all your blue and white. I have adult kids now and still miss the days when they were home with me. Have a fun s’mores party tonight! What a nice compliment thanks so much Tricia! I love having my kiddos home in the summer. Hi! I LOVE your home! Where are the cabana curtains from?? I think I bought them on Wayfair? This is so beautiful 😍 and I’m sorry if you already answered this but what color cushion did you choose? I went with the white! Hi Aurora I’m not sure we just bought the panels at Lowe’s, I don’t recall what kind of wood it was – thanks! I’m in love with your entire home! Best taste ever!!! I was wondering if you happen to remember where your pool tile came from? We are putting in a pool and I want a patterned tile that’s blue and white and I’m having the hardest time finding something. Thank you! Hey Britney, this pool was built in the 50’s actually so this tile is basically vintage ha! Wish I had a better answer for you – thanks! I love your Cabana. We need something like this in our backyard. 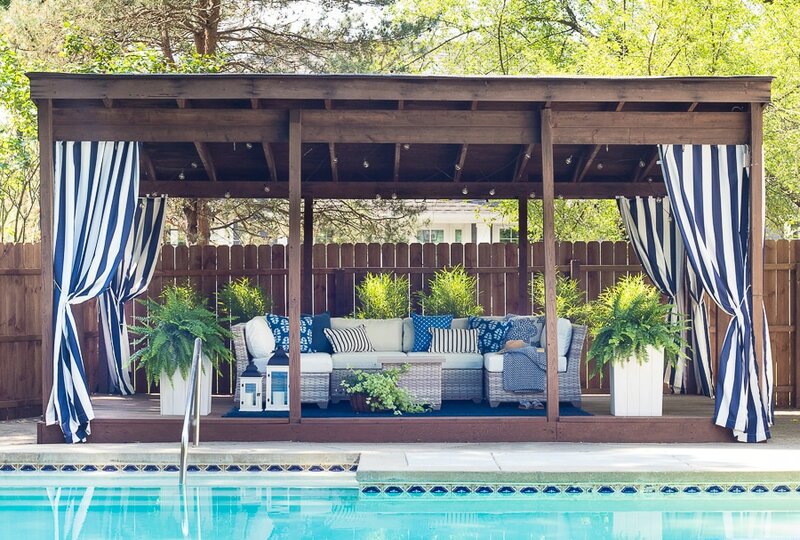 Can you please share the measurements of your Cabana? Hey I can’t get over there at the moment because the gate is stuck shut from the snow but I’d guess it’s about 15 ft x 10 ft – thanks! Love it! So classic and fresh looking. Where did you find the striped curtains? They were from Wayfair – thanks!